It seems that many authors think that their sci-fi or fantasy books must run 200,000 words to qualify as a world-building epic. As we discussed before, that isn’t always the case. There are many lengthy books that are must reads, but many others that fail to let their stories breath and trust their readers’ imaginations. 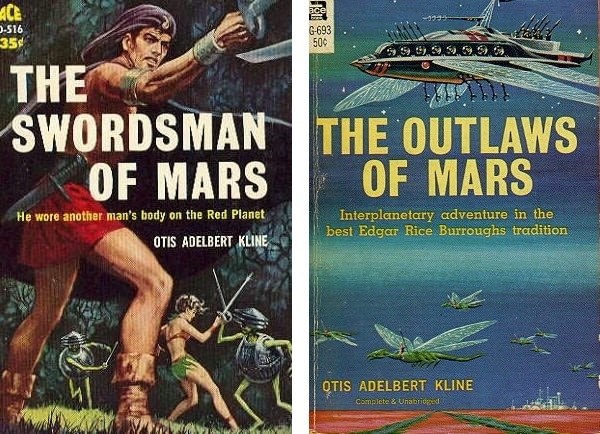 Older sci-fi tended to be much shorter, such as Otis Adelbert Kline’s The Swordsman of Mars and The Outlaws of Mars. A contemporary of Edgar Rice Burroughs, Kline wrote in the same vein of swashbuckling adventures. Does the short nature of these books mean they lack detail? No, you quickly find yourself on the red world, immersed in another culture. for a short while you are there on a world that never was. I have often argued that just enough detail can go along away to implanting images in the reader’s mind. Describing every last button and rock along the trail just slows down the journey. A writer must learn when to detail and when not to. Where to pause and give more, and where to forge ahead and trust the reader. Surely reader preferences may come into play, but most want to be pulled in and stranded in a fantastic adventure. The Red Planet is a good of a place as any to start. Very True. Length is not everything.